Announcing our 2018 Costume Contest! | Take Back Halloween! Announcing our 2018 Costume Contest! The countdown has begun: exactly two months from today is Halloween. Will you be ready? Will you be wearing a fab historical costume? Will you have photos? Will you enter our contest??? Let the answer to all of those questions be an enthusiastic “yes!” Our 7th Annual Take Back Halloween Costume Contest is on. 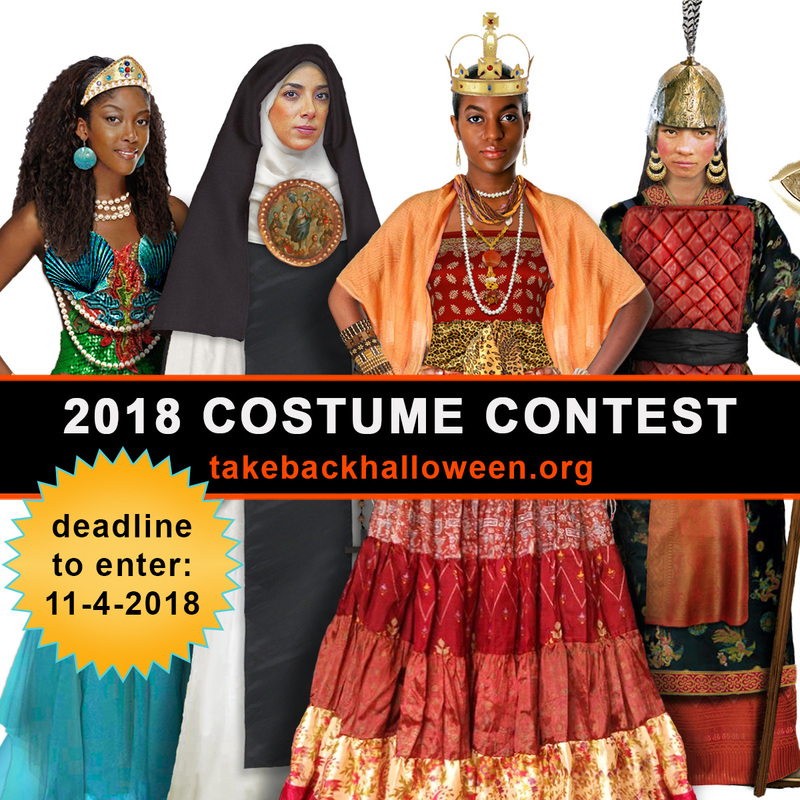 Send your photos to contest@takebackhalloween.org, and we’ll upload all the entries to our 2018 Costume Contest Album on our Facebook page. The deadline for submissions is 11:59 pm EST on Sunday, November 4, 2018. The prizes this year are almost the same as last year, but we’ve simplified the divisions just to make it clearer (we hope). Basically there are two divisions, and within each division there are three levels: Amateur, Professional/Expert (see below for criteria), and Junior (age 15 and under). This is our traditional division, the one we’ve had since our very first contest. As ever, we’re looking for costumes that fit into our own costume categories here on the website. That means a goddess or mythological figure, a great queen, a notable historical person, or a glamorous star. These should be specific people, not generic costumes. Historical Recreation: This is for costumes that are based on an actual garment, statue, painting, description, or illustration. Examples might include: a replica of an archaeological find, such as the golden suit of Issyk; a dress based on a painting; a copy of a museum piece; an outfit depicted in a photograph; or a costume inspired by an imaginative illustration, such as one of Mucha’s posters. The costume you’re copying or recreating should date from no later than 1960. Period Costume: This is for costumes that look as if they date from a certain period of history (though it’s fine to use modern parts and techniques in construction). Tudor England, Heian period Japan, Mughal India, Viking Age Scandinavia, and the American Civil War are just a few examples of costume periods. This category is ideal for those of you who are focused on recreating a style of clothing rather than dressing up as a specific historical person. The time period should be no later than 1960. Fictional Characters: What we’re looking for here are characters from literature, art, movies (yes, we’re allowing movies), or other media who are in period costume. This can be your own interpretation or your attempt to recreate a costume from a movie or other illustration. So, for example, you might come up with your own version of Meg’s ballgown from Little Women, based on the description in the book, or you could try to re-create a costume from one of the many, many filmed adaptations of the novel. The time period for your character’s costume should be no later than 1960. Fantasy Costumes: This is a difficult category to explain. It’s for costumes that have some kind of historical connection but don’t fit into any of the other categories. Many of the brilliant costumes in Black Panther, for example, are inspired by historical designs (think Queen Ramonda with her Zulu isicholo hat), so they would fit in this category. If you’re not sure about your costume, just email us or message us on Facebook. Do you belong in the Professional/Expert level? If you’re an expert seamstress, a professional or semi-professional cosplayer, a Renaissance Faire performer, a theatre person, or someone else with access to professional-quality costumes, let us know when you submit your entry. The goal here is just to make sure folks can compete at their own level. Your costume has been exhibited at a cosplay convention or entered in a cosplay contest; it is a professional costume used for Renaissance Faire performances or historical reenactments; or it is a professional stage costume suitable for theatrical performance. 9. The deadline for submissions is 11:59 pm EST on Sunday, November 4, 2018.